This class can be used to generate form to edit data stored in MySQL databases. It can generate HTML forms with several types of fields, executing SQL queries to retrieve the default values of the MySQL database table fields. 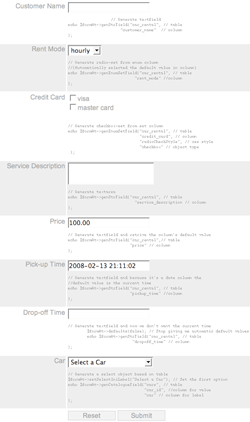 The class can generate text or textarea form inputs depending on length of the database table text fields. It can also generate checkbox, radio, and select inputs to edit enum or set database table fields.